We have substantially completed the flat roofs on the east and north building in Antigua. The project has been slowed by our marine weather and the “May grey”. This product has an absolute requirement that the surface be completely dry before you can apply it. With the slow drying of the condensation in the morning and the high winds in the afternoons it has reduced the working window that the contractor can spray the material. I have been on the roofs numerous times and can tell you they look really good. We’ve also been able to remove a lot of old wires, antenna’s, etc. Plus, we removed over 12 tons of that grey gravel that used to wash off in a rain storm. Not having that on the roofs will allow us to keep the roof drains clean and open every fall before the rainy season. It was amazing to me, to find a number of skylights that have never been attached. They were just sitting on their mounts and you can see they never had a screw put in them to hold them down. We have of course mounted them and the roofing process will seal them around the edges. We have completed our first walk of every dock. 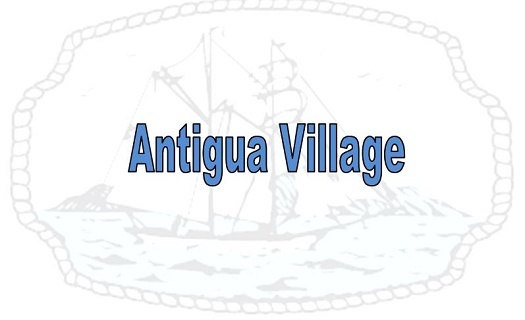 In general Antigua is in good shape but there are a lot of small items to repair. First thing will be the replacement of the wiring to the dock boxes. Dan at the CCHOA has a process to attach the wires without the need for them to drop into the water. It’s very clean and hopefully will reduce some of the electrolysis in the area. We have completed the repair and painting of all the dock ramps in Antigua. If you see anything we missed, please feel free to call it in to the HOA offices. This subject has come up several times in the past few years. While we have a number of dingy dock that have been added with permission, there are a lot that have simply have been attached. While these were originally intended to store a small dingy or kayaks, they have now grown to being very large. As a Village we are going to need to determine what size is acceptable, what can be stored on them and how they are attached to the existing dock. I will be looking for any owners who want to participate in a committee to get this resolved. A suggestion which seems to be working in other Villages for paddleboards, kayaks and small boats is a product from a website called “Boatstogo.com” Search “Floating dock container”. They cost 169.00 plus 29.00 shipping. You can get the required 4 foam panels at Home Depot for 21.00 each or 84.00 total. Not a bad solution for storing small water craft off the dock. The board continues to try and stay ahead of this situation throughout the Cay’s Communities. Short term rentals are a problem in every Village. We are working with not only vendors but the City of Coronado to determine those residents that are renting by the day or week. You will note the Board passed and was included in the budget mailing a new Short-Term Rental Policy. It now calls for fines of $2500.00 for the first violation and $3000.00 for the second violation. If you believe this type of activity is occurring in your area, please call Chuck Henning (Compliance officer) at the HOA office and let him know. Nice to see this year we had no fewer than 7 hummingbird nests in Antigua. They really seem to like this Village. We have recently had two leaks from upstairs units. These leaks occurred when a hose inside the unit failed and in one case both the upstairs and downstairs owners were out of state. The damages from that leak will easily exceed $150,000.00. While these expenses are being paid by each owner’s insurance, it really is a mess. As we all know when one unit is getting remodeled, everyone in that quad is disturbed by the reconstruction activity. I would encourage any owner who is going to leave your unit vacant for any length of time to secure the water to the unit. I think every unit has a labeled water shut off in the trash area. With the water shut off and any appliances secured we can prevent some real distress between owners. With the savings from last year’s operating cost we were able to, as of 7/1/18, repurchase earthquake insurance. Antigua use to carry this policy and for some reason years ago it was stopped. I will include the policy limits and details in the next newsletter, however it seems more than prudent to have this coverage given the area we live in. The one thing about being a director is you hear from a number of people about a number of subjects. In the most general terms, be nice to your neighbor’s, pick up after your dog and try to park in your cars in a garage. These simple things would reduce my phone calls by 90%. Thanks for all your patience and understanding.